Why is it so hard to think clearly? With medical insights, “progress,” wisdom distilled through time, and technology, you’d think our minds would work with laser-like precision. It’s harder to think clearly than you think. What often happens is that we load up our schedules assuming that we can do it all (which we can’t) and thinking it will make us happier (which it won’t). The result? We end up tired and tangled, flailing for an escape hatch. Time to think clearly. Time to restore balance. To do that, a quick question about control: How much control do you have over your life? Well, you actually have less than you think. Have you ever wondered why there are crosswalk buttons? I doubt any of them actually do anything; but they give us the illusion of control! But of all the things you DON’T have control over, there are things you DO have some control over. 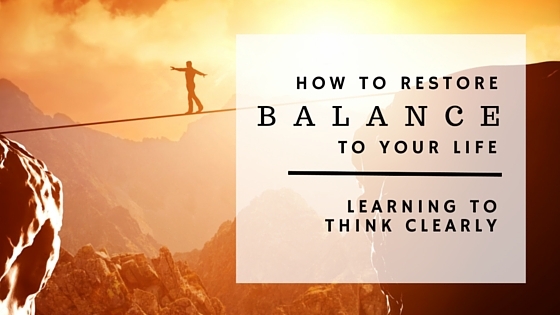 And thinking through a few basics might be the next best step toward balance in your life. First, be honest about your situation. Is this level of crazy tenable over the long-haul? Short term hectic happens; long-term hectic will fry your brain. If you think the craziness in your life is affecting just you, you’re wrong. It affects everyone in your immediate care-circle. I think people live with two great illusions. One is the illusion of tragedy–that’s where we always assume the worst case scenario. The other is the illusion of prosperity–that we can “have it all” just by thinking about it but without any hard work. The truth is often somewhere in the middle. Things don’t usually turn out as bad as we dread, and things can be pretty good if we work hard to get there. It has to do with a better grasp of what we can achieve (and what we can’t). In Captivology, Benn Parr explains how heavy multitaskers are not LESS distracted, but MORE! 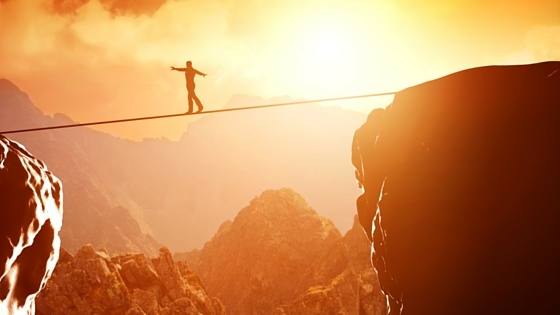 Just because you like to do 10 things at once, doesn’t mean you can do them all well. Here’s how I like to think about it: Success is focusing on the right things at the right time for the right reasons. "Success is focusing on the right things at the right time for the right reasons." So much of what Jesus talked about was priorities. (To read my blog on what Jesus actually said and did most click here.) If you’re a Christian like me, seeking God and his kingdom above all trumps everything else. After (and within) that, we need to work at what our priorities are. As I’ve said before, we don’t need more time or less tasks–but clearer priorities. Pastor Andy Stanley has a key question he uses to help hone priorities and make better decisions: “In light of my future hopes and dreams, what is the wise thing to do?” If you also take that question seriously it will positively impact what you do in the here and now. Re-organize where you’re putting your time and energy. This is one of the hardest things because it will mean you’re leaving PleaseEveryoneVille. You may need to make significant changes to your routine, your work, your relationships. Some kids’ activities will have to go, as will some grown-up frills you’ve always banked on. But you’ll find that quality of life goes UP, not down. Just as physical strength is possible if you’re willing to work out, and just as spiritual maturity is possible if you’re willing to pattern your life on Christ—balance is possible if you’re willing to simplify, slash and burn. Are you willing to do it? Can you re-organize and re-train? Or is it too hard? In this process, remember that you can control some things, but not everything. Laugh at your mistakes. Smell the roses (unless you’re allergic). And have an extra scoop of ice cream. There’s a certain irony to my writing this today. Why? Because I’m on my back in significant pain! But these moments always teach me to pause, reassess, and again find the sweet spot. Make the best of the life you have–not the life you wish you had. Next Post: How Does Your Faith Affect Your Vote? This is so true Matthew. I know it, but as you said it is hard to do. I am reminded of it every time I facilitate The Chronic Pain Self Management course. Participants want to get back to the way they were and think they can do it overnight. I tell them to take baby steps and build up their stamina first if they want to succeed. Without the stamina the good they have done will not last and they hurt themselves. I have learned more from the bible by reading less each day and understanding more. Small doses seems to work for me. Hope you will recover quickly. Hi Corry, having just hurt my back you give good advice for me too! Thanks! Good advice. Thanks Matthew. Time to work on some of this myself.